Spain is well-known for its long, hot summer days—especially those spent by the beach with pitchers of sangria and giant pans of paella. But winter is also a great time for visiting this Mediterranean country, as temperatures are cooler and crowds are less overwhelming than during the summer months. February is the off season for travel to Spain, but if you want to save a bit of money on your trip, it could be a good time to visit since flights and hotels are generally cheaper than in the spring, summer, and fall when the weather is warmer. February in Spain can be chilly, but daytime highs throughout the country range from the high 40s to low 60s Fahrenheit, with nighttime temps dipping into the below 40 degrees Fahrenheit, and even into the 30s. The weather in Andalusia in Southern Spain is relatively mild, and that might be the top choice for a trip to Spain during February. As the highest capital city in Europe, Madrid gets the cold in a big way, especially at night. Wrap up warm. The city tends to stay reasonably dry, but you can still expect rain on about one in three days. Meanwhile, Barcelona is a little warmer in February than Madrid because of the warming effect of the sea, but not much. It doesn't rain much in Barcelona in February, so expect deceptively blue skies; it might look warm, but it isn't. Andalusia is, generally speaking, an exception to the rule; it won't get anywhere near as cold here as it does in the north. It is often a bit warmer inland, such as in Seville than on the coast. It is still too cold to sunbathe in Andalusia in February, but you'll feel significantly warmer here than in the rest of Spain. It's too cold in the north of Spain during February to sunbathe, but that's the least of your worries. You can expect rain every other day in Bilbao and San Sebastián, so an umbrella is as important to pack as a good winter jacket. If you thought Bilbao was wet in February, wait until you get to Galicia and Asturias in Northwest Spain. If you don't like the rain, your days will be ruined more often than not if you visit this month. Without a doubt, the most important event in February is the carnival, which usually (but not always) takes place during this month. Check the calendar to make sure before you go. Sitges carnival: Held in Barcelona, this is one of the biggest and brashest in the country. Expect lots of colorful costumes and plenty of drinking in the streets. Festival de Jerez: Toward the end of the month, this one of the most important flamenco festivals in Spain. If you're in Jerez a bit earlier, it is a good place to base yourself for visiting the carnival in nearby Cadiz. 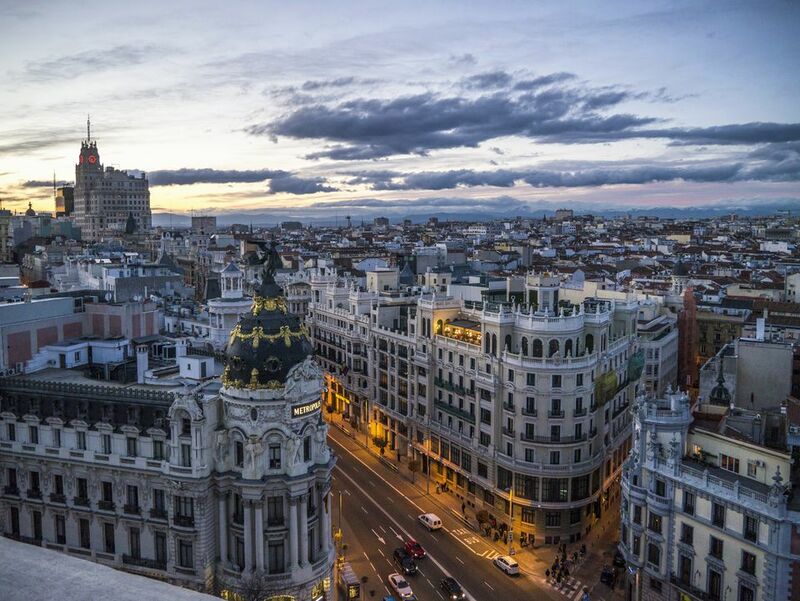 ARCOmadrid International Contemporary Art Fair: The Chueca area of Madrid is famous for its carnival, but it's also easy to avoid if that's not your thing. Bt this month also sees this impressive art fair, which includes historic avant-garde and contemporary classical works, along with contemporary art. Gastro Festival: Madrid celebrates Spain's culinary culture each year from the third week of January through the first week of February, as cocktail bars, restaurants, and cafés come together to celebrate the Gastro Festival. Almond Festival: La Palma on Gran Canaria is known for its almond, and locals celebrate the nuts abundance in February during the town's celebration of almonds. In addition to other almond-related activities, participants are challenged to crush as many almonds as they can in 30 minutes. Bocairente: Valencia observes bocairente throughout the month. This event includes re-enactments of the fights between the Christians and the Moors, as well as parades and fireworks. Spain has more mountains than any other country in Europe, which means great skiing! If you're looking for high-end ski resorts in Spain, the Pyrenees, along the border of Spain and France, is home some of the world's best. Even the south of Spain, in Sierra Nevada, is home to plenty of great powder. Spanish summers are hot, which means many shopkeepers and restaurants owners flee to cooler climates. Luckily, this isn't the case during the winter: Visiting in February means you'll find most towns in full-swing, with plenty of action. Spain isn't a cheap country to visit, but traveling during the winter drops costs considerable. It's not unusual to find a decent hotel room for 40 Euro per night—or less!